The Legacy of Sir Donald Bradman | The International Cricket Hall of Fame. Wednesday, 25 February 2015 marks the 14th anniversary of the death of Sir Donald Bradman. One of crickets’ most expansive and progressive thinkers died, aged 92, in 2001 after a lifetime contributing to the game both on and off the field. Born in Cootamundra and raised in Bowral, Bradman remains the world’s leading batsman, an astute captain, selector, administrator, author and national icon. The ICC World Cup tournament is currently being played in Australia and New Zealand. Bringing together all the leading cricketing nations together with their legion of passionate fans, all the colour, diverse cultures and skill are on show as cricket celebrates 50 over one-day game. The anniversary of his death begs us to revisit Bradman’s thoughts on cricket. It is worth remembering that Sir Donald was Chairman of the then Australian Board of Control for International Cricket (now Cricket Australia) which introduced limited-over cricket to the international calendar in 1971. When rain caused the abandonment of the third Ashes Test in 1970-71, Sir Donald ensured that Australia and England met in a 40-over match at the Melbourne Cricket Ground on January 5, 1971. And he was still in office when Australia agreed to play the first series of limited-over internationals – three 55-over matches in England in 1972. Sir Donald always acknowledged the game must adapt to change and often imagined how he would have fared at the shorter-form of the game. He would have been captivated by the current competition and its global reach. Inevitably the face of cricket changes with the passage of time. The game must adapt to the social era in which people live. Nobody, fifty years ago, could have foreshadowed night cricket, coloured clothing, white balls and so on, but I do not resile from such happenings providing we are able we are able to preserve the underlying character-building edifice upon which the game was founded. This responsibility must be shouldered with care and foresight by contemporary players and administrators because they are now the custodians of a valued trust for future generations. 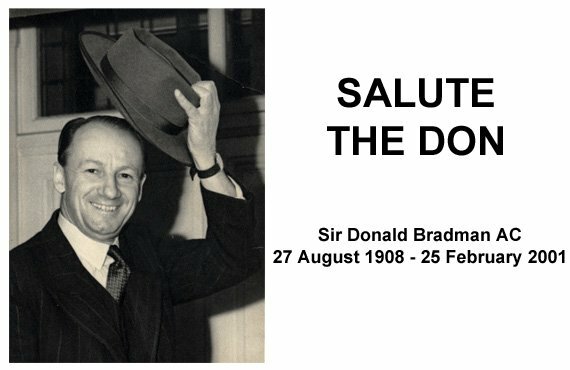 In support of his legacy the Bradman Foundation urges the public to #SalutetheDon and tip your hat to assist keeping his legacy at the forefront of the game.